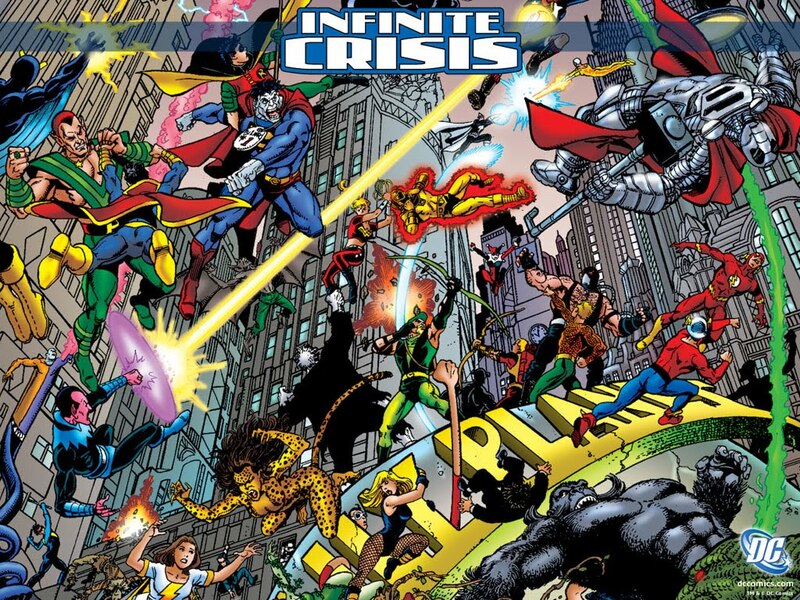 The Billionty-Oneth Geek: DC's Infinite Crisis!!! About two months ago, me and a friend were talking about comic books and sharing about some of the stories that we were enjoying. He was telling me about DC's Infinite Crisis, describing the story and it interested me. At the time, I thought that I had never read it before, so earlier this month, I dove right into this seven issue series. With each passing issue I kept thinking to myself, "wow, this story seems really familiar". And in fact, there were numerous times where I would predict what would happen on the next page... I must have read it before and it turns out I did. So I talked to my friend again and it turns out he had read Final Crisis, a different crossover series from DC Comics. Looking back, this was a happy mistake because it's been a long time since I first read this story arc which I enjoyed the first time around and still enjoyed this second time. Released originally in 2006, Infinite Crisis is a crossover series in the DC Universe that sought to undo some of the changes made 20 years prior. In 1985, a crossover series called Crisis on Infinite Earths took place which in order to create a simpler continuity, managed to merge the multitude of universes that existed (the multiverse) into one single universe. Infinite Crisis serves as a sequel to CoIE, reintroducing us to some of the ideas and characters from Earth. This time around though, a band of characters are trying to undo the changes made in Earth by separating the single universe back into a multiverse. The heroes of course join together to fight off the impending threat. There's a good sense of mystery during this series and even when it's revealed who the true villains are, the build-up to the turn and the reveal of their intentions is equally gripping. The series has this continuing theme of heroism that calls into question the intentions and values of DC's trinity (that being Superman, Batman and Wonder Woman). At the end of the series, the three heroes come to a crossroad that leads right into the next big DC event called Fifty-Two, where for one year straight, the trinity take themselves out of a commission, letting Earth's heroes to fend for themselves (which I finished reading last week, will write up soon). "I don't think this boy realizes how lucky he is. Or how important the symbol he wears is. His jaw clenches as he opens his shirt. For a moment I see the man he could be instead of the boy he believes he is." The series was an intriguing read, and even better, they did well in crafting a resolution that leads into another series. This was a good read and an absolute must-read if you've read Crisis on Infinite Earths in the past. Later geeks!